Filmmakers: Dr. Raymond W. Dowidat and Esther Dowidat. Transfer Note: Copied at 18 frames per second from a 16mm print preserved by the Minnesota Historical Society. New Music: Martin Marks. Running Time: 14 minutes. Amateur filmmaking captures lives and communities overlooked by professionals. Cologne: From the Diary of Ray and Esther is a superb example of how home-movie practice can produce a widely revealing social documentary. Filmed in 1939 by the town doctor, Cologne is a personalized portrait of a farming community that merited only a single sentence in the WPA’s 1938 guidebook to Minnesota: “COLOGNE (945 alt., 355 pop.) is a German community named for the ancient city on the Rhine.” Dr. Raymond Dowidat and his wife, Esther, arrived in 1937 for his first practice after internship, and the impulse for the film seems to have arisen from their desire to document Cologne before they moved on to his next position in Minneapolis. For this finely made amateur film, choosing music was not difficult. The recurring principal theme is the hymnlike “Hail! Minnesota,” written by Truman Rickard circa 1904 and adopted as the state song in 1945. The other principal pieces used, in order of ap­pearance, are the first movement of Mozart’s Piano Sonata in A Major, K. 331 (for the opening scenes of the town and its environs); Victor Herbert’s “Indian Summer” (the duck pond); the third movement of Beethoven’s Piano Sonata in F Major, op. 10, no. 2 (inside the mill); Michaelis’s “The Blacksmith in the Woods” (the mayor at his anvil, etc. ); Abe Holzmann’s march “Blaze Away” (the fire department parade, etc. ); Johann Strauss’s “Galop: Die Bajadère” (making turtle soup, etc. ); and the familiar drinking song “There Is a Tavern in the Town” (“In Cologne, everybody drinks beer.”). 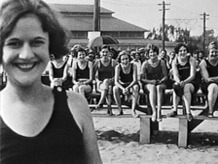 The original 16mm film was rediscovered by Adelle Johnson, the filmmakers’ daughter. She was surprised to find it something more than a family movie and donated it to the Minnesota His­tor­ical Society, which made new preservation copies of the fragile ace­tate film in 1999 through Treasures of American Film Archives funding.